with or without an NSAID. Psychological factors increase the risk of development of chronic pain. Chronic back pain is difficult to treat and the best outcomes are typically achieved by a multidisciplinary approach. 1. 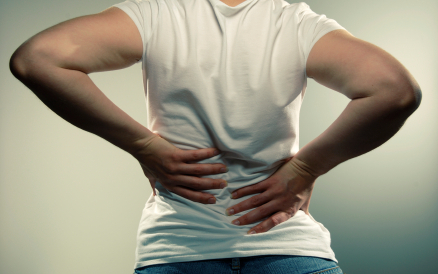 Acute: Back pain that comes on suddenly and lasts less than 6 weeks is classified as Acute Back pain. 2. Chronic: Back pain that lasts for more than 3 months is classified as chronic and is relatively less common as compared to acute back pain. Manual labor or excessive back strain. Psychological conditions like depression and anxiety. Bulging or rupture vertebral disc. Clinical features: The episodes of back pain may be acute, sub acute on chronic depending upon the underlying cause. The pain be characterized as a dull ache, shooting or piercing pain or a burning sensation. The pain may radiate into the legs and feet. The most common area of pain is the lower back or the lumbar region. Gastroesophageal reflux disease also known as GERD, is a condition in which the stomach contents leak backwards from the stomach into the esophagus. 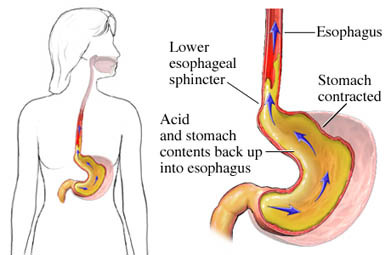 It is a chronic digestive disorder and since the stomach has acidic contents it irritates the lining of the esophagus. Pathophysiology: Normally when we eat, the food passes from our mouth through the esophagus to the stomach. A ring of muscle fibers in the lower esophagus that make up the lower esophageal sphicture (LES) normally prevent the gastric contents from backing up into the esophagus. Reflux occurs when LES pressure is deficient or when the pressure within the stomach exceeds LES pressure. Use of certain drugs e.g : anticholinergics, diazepam, morphine, bronchodialtors. Cognitive therapy is a psychological treatment method that helps patients correct false self-beliefs that contribute to certain moods and behaviors. The basic principle behind cognitive therapy is that a thought precedes a mood and that both are interrelated with a person’s environment, physical reaction, and subsequent behavior. Therefore, changing a thought that arises in a given situation changes mood, behavior, and physical reaction. Although it is unclear who benefits most from cognitive therapy, motivated patients who have an internal center of control and the capacity for introspection likely would benefit most. Background: Cognitive therapy was developed by American scientist Aron T Beck. in the 1960' s. It is based on a cognitive model which states that thoughts, feelings and behavior are all connected. Difficulties can be overcomed and goals achieved if inaccurate and negative thinking can be controlled. This form of psychotherapy has been found to be effective for a large number of psychiatric disorders including but not limited to depression, anxiety, eating disorders, substance abuse and personality disorders. CBT is based on the idea that our thoughts causes our feeling and behavior so if we can change the way we feel we can change the situation even though the situation has not really changed. 1. Building trust and rapport with the patient is very important as in any other case and helps in getting close to the patient and understand him more accurately. 2. The basic question to ask a patient is is reporting a distressing situation or dysfunctional behavior is " what is going On in your mind right now?" This helps in identify the negative thinking and an approach to think differently. 3. In the first step the therapist helps the patient identify the problematic belief. This is known as functional analysis. The process may sometimes be difficult initially but ultimately leads to self discovery and insights. 4. 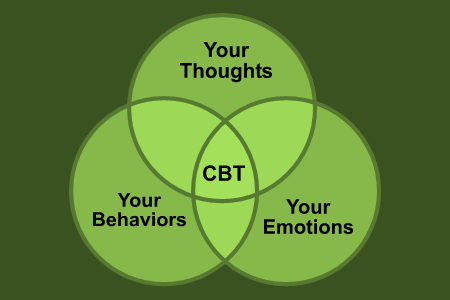 The second part of CBT focuses on the actual behaviors that are contributing to the problem. The patient begins to learn new skills and tries to put them in real world situations. 5. CBT is a gradual process that helps in changing the behavior in a slow step wise process.